I'm a wedding enthusiast chronicling all the beautiful things that inspire me. I'm an amateur cook, HGTV devotee, and crafter extraordinaire. Oh, and I love... love. With Notable Inspiration, I seek to showcase individuals that I find exceptional and inspirational. If you see an improperly credited photo or if I have used a photo of yours that you would like removed, please contact me at kellylanza@gmail.com and I will be happy to update accordingly. 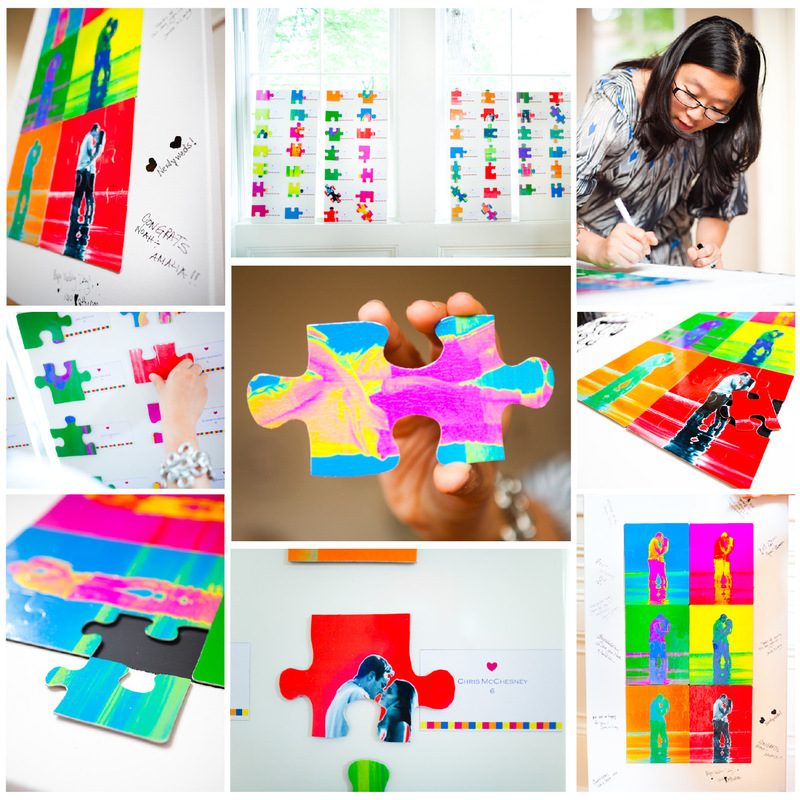 Yesterday I brought you my entry to the Inspired Creations Contest, where I teamed up with Bellwether Events, Kurstin Roe Photography and Two Brunettes to create a vibrant and super (Ok, I mean really super) fun wedding centered around puzzle pieces and pop art! As promised, I'm bringing you the DIY details on how we created my favorite part of the concept, the placecards turned puzzle keepsake guest book! Here we go! Our concept had six tables with nine guests per table. Each table got an eight-by-ten puzzle and each guest got a single puzzle piece as a part of it. 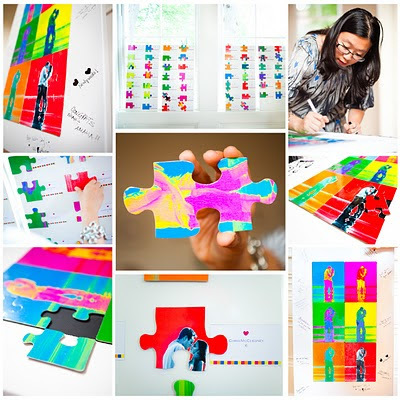 Of course, you could also design it so that the guests create one larger puzzle instead but for our theme we wanted to have multiple to bring out the pop art vibe. 1. The Puzzles: We uploaded an engagement photo and turned it into pop art by playing with the colors on Photoshop (you can simplify this by altering the colors on your basic photo editing program, like iPhoto). Each table got a different colored photo. Then we recruited the Joslin Photo Puzzle Company to produce the puzzles. It’s as simple as uploading the photos to their website and choosing the size puzzle you want. With puzzles in hand we affixed a magnet to the back of each individual piece. 2. The Placecards: Carolynn designed a simple placecard to complement our puzzles and sent over the file. We purchased Avery Inkjet Magnetic Business Cards (available online via Staples) to print the placecards on, separated them and voila! Magnetic placecards! 3. The Display: To display the placecards easily and visibly, we used four magnetic white boards from Ikea. You can hang them, lean them against the wall or even place them on easels! A magnetic puzzle was placed on top of each placecard so each guest took both with them to their table. 4. The Guestbook: We bought a large (24 x 36 in) canvas to use as the basis for our guestbook. We laid out the puzzles in the middle and traced around the perimeter to map out the area we needed to magnetize. We put down blue painter’s tape along our lines and painted the inside with magnetic primer (Home Depot). Three coats are required for the best hold and each coat dries in about 30 minutes. To re-cap how the placecard to guestbook worked... We placed the placecards & individual puzzle pieces on the magnetic boards. Each guest took their puzzle piece to their table where they then assembled the puzzle with their tablemates. The table then collectively placed their puzzle on the magnetized canvas and signed around the border. Phew, can you handle all that? My favorite part is that both components of the placecards are useful! The card itself is a magnet that you can use on your fridge and the puzzle becomes a keepsake for the couple! There's nothing like being resourceful! Don't forget, if you love our concept, please take a moment to leave us some love over on EAD by clicking HERE! Have a wonderful weekend!